Your flowers are often the central element of your wedding decorations and are the area where your wedding colour scheme will shine through most obviously. If you’re looking for flowers to suit a particular wedding theme check out our quick guide to wedding flower colours. Gold works best at an autumn wedding, although it can look lovely at a Christmas wedding as well. You could include gerbera, iris, orchids, primroses, chrysanthemums, roses, amaryllis, and sunflowers into your gold theme. Gold, like all metallics, is a very popular wedding colour, and a number of brides are even choosing gold wedding gowns instead of the traditional white. 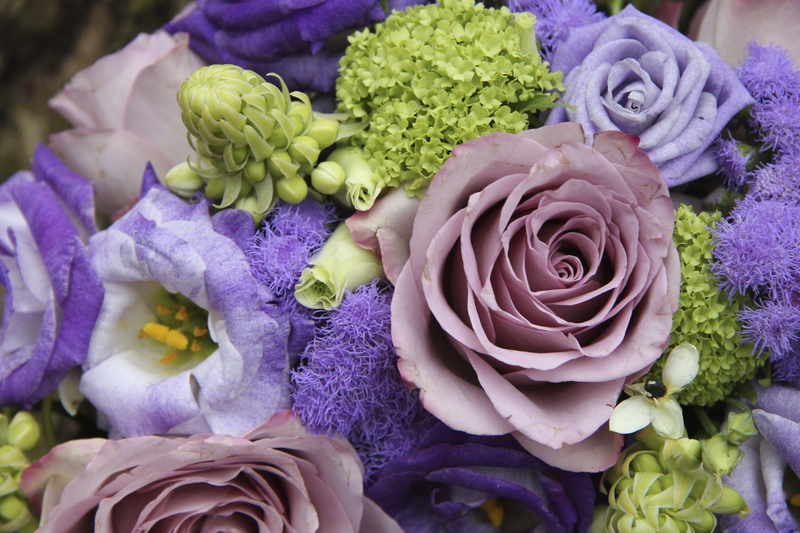 Lilac and lavender are perfect colours for spring weddings, while deep purple is more fitting in winter weddings. 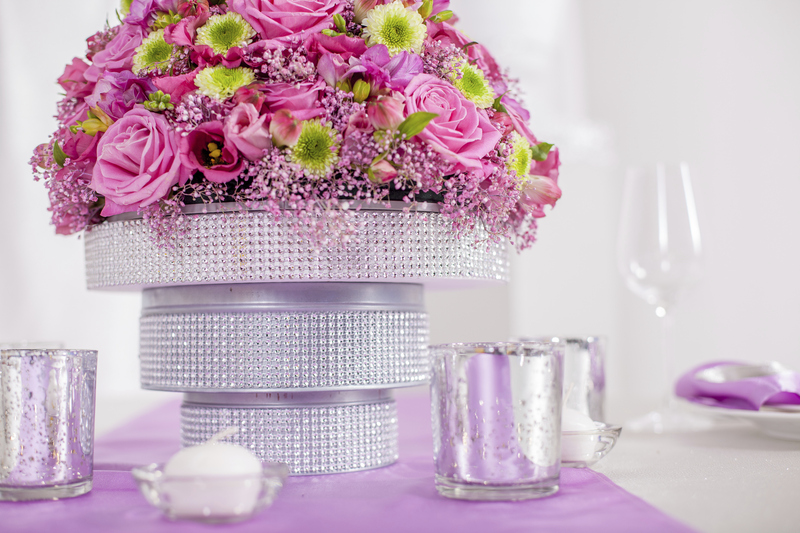 Purple flowers to add to your arrangements could be alliums, lisianthus, anemones, or violets. Purple is a royal colour symbolising mystery, drama, and elegance and all shades of purple pair well with yellow. Green is a fresh colour for spring or summer weddings, and can look great together with yellow, pink or chocolate brown. Green flower displays will feature mainly foliage, perhaps with white flowers, but you could also keep in mind zinnia and moluccella, also known as Bells of Ireland. Green is a natural colour, and is a fantastic colour for eco weddings which are a growing trend at the moment. Black orchids are a costly choice, but they make a striking arrangement. The majority of florists can arrange to have other blooms such as roses dyed black. Black is traditionally a funereal colour, but monochrome weddings are currently in fashion so you might be looking for blooms to create a black and white bouquet. This pure, clean colour looks good in any season, but is especially effective for winter weddings when highlighted with silver. White blooms for your bouquet and centrepieces could utilise lilly of the valley, waxflower, roses, daisies, gypsophila, gardenias, orchids, iris, cala lilies, and narcissus. White is the conventional bridal colour, and pure white weddings are definitely back in fashion. Keep in mind that white comes in many shades, so your bouquet might still clash with your dress even if they are both white. Pink is perfect for a spring or summer wedding. Pale pinks have been utilised in wedding colour schemes for years, but additionally, hot pink is becoming fashionable when paired with aqua or white. Pink blooms to pick from include chrysanthemums, azaleas, carnations, bouvardia, gerberas, orchids, primroses, roses, amaryllis, anemones, freesias, and sweet peas. Pink is a favourite wedding colour, partly because it signifies femininity, innocence, and happiness. Yellow looks great with green as well as blues and purples. Yellow flower options include gerberas, mimosa, chrysanthemums, hibiscus, tulips, daisies, amaryllis, sunflowers, roses, freesias, begonia, and goldenrod. Yellow is a happy energetic colour symbolizing friendship, and it makes a great colour theme for fresh spring weddings, or summer seaside weddings. In addition, it can be paired with oranges, reds and gold for an autumn wedding. Bright reds are very effective when utilised for autumn or Christmas weddings, and dark reds work magnificently in winter weddings. If you are looking for red blooms to complement your theme try chrysanthemums, freesias, conventional red roses, celosia, geraniums, carnations, primroses, amaryllis, bouvardia, or poinsettias. Red is a powerful, bold colour associated with beauty and passion. Blue signifies openness and serenity, important elements of any marriage. Depending on the shade of blue you have selected, you could consider violets, muscari, eryngium, delphiniums, hydrangeas, iris, amaryllis, or anemones for your bouquet and flower displays. Blue is becoming increasingly popular as a wedding colour and pairs well with silver for a winter wedding, or yellow for a summer wedding.